Made to Order | Bartok design Co. Made to Order – Bartok design Co.
SUEOKI type The bathtub is positioned on the floor in such a way that the wooden front is exposed. This solution is preferred when also the walls are finished in wood or just to enhance the elegant simplicity of the space. See the details for more info. 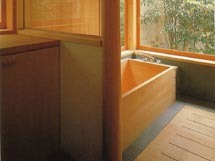 UMEKOMI type The bathtub is recessed and it is mostly visible the inside rather than the outside. This solution may be slightly and limits the cleaning and maintenance to the interior surface. See the details for more info. CUSTOM type Any size, from family to pool type. Any shape including round, oval, poligonal etc. Most commonly we prefer to accept payment via Wire Transfer. PayPal For amounts of less than ¥150,000 JPY PayPal is a more convenient option. The fee for each transaction is 4% on the transferred amount. Wire Transfer The wire transfer fee is ¥6500 JPY, per transaction. For larger amounts, a wire transfer is cheaper. Your bank will make the conversion and detract the relative amount in your own currency from your account. Once your order is confirmed we will send you the relevant details and instructions. Thank you for your interest in our Japanese bathtubs！ First question: We use only hinoki wood from the Kiso Valley - Nagano prefecture (or Asnaro wood from Aomori prefecture) from old growth forests. Lumber 300+ years old dried with natural ventilation is very stable and will not warp/buckle/crack unless in extreme conditions. Wood is still a natural material so you understand that it cannot compared with steel or acrylic. To prevent cracking we ask to respect 3 conditions: 1) do not use heating or air conditioning in the bathroom while the tub is empty (or if you do take some precautions-> see below*) 2) use the tub regularly, at least 2 times a week. Daily use is preferred. (if you are away for extended periods, take some precautions-> see below*) 3) we supply a complimentary hygrometer. Keep an eye on it. (if the relative humidity is below 50%, take some precautions-> see below*) *) keep some water in the tub and cover it. Alternatively, place a bucket with some water inside in the tub and cover it. **) if you use the tub daily, you do not need to worry about point 3) --------------------------------------------------------------------------- Second question: If properly maintained a wooden tub can last 30 years or more. 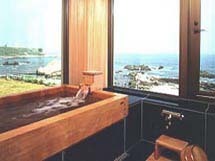 In hotels or ryokans (japanese inns), bathtubs are replaced every 10-15 years. 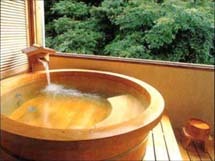 Japanese climate is extremely humid, therefore in our experience tubs installed in Europe do not face some of the problems typical of wooden bathtubs (insurgence of black spots, stains.) 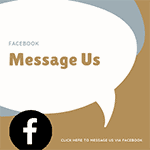 We are looking forward to working with you and remain at you disposal for any question/problem. Shipping by Sea or Air? Understandably many people think that ocean freight is cheaper. In the past this was true. These days we prefer air freight. Air freight is becoming the industry standard for this type of maker-to-end user shipment. It is fast and since it is competitive with a lot of air freight companies operating the main routes, we are able to secure cheaper prices. We always get several quotes and find the best deal for our clients. For shipping a regular size ofuro, ocean freight is often more expensive. There is higher risk of customs inspections and time-consuming formalities. For this reason, we do not recommend ocean freight. We ship worldwide, trying to find the best deal possible. We often use FedEx or DHL.